Posted May 5th, 2018 at 2:22 pm | Log in to reply. Maangchi, if we eat it the next day, what’s the best way? re-heat, or eat cold? I think cold, don’t you? Re-heating could spoil the texture…! Posted April 16th, 2018 at 1:31 am | Log in to reply. I made this for our lunch today..i fell in love with this recipe and my family love this too! I’m so happy every time i cooked Korean food my family like it very much, I’m so blessed to know this site and really help me with my cooking, I’m a working mom but i make sure to have time to cook healthy and tasty food for my family. My kids are Picky eater but this recipe made them ask for more..thanks maangchi!! Posted April 16th, 2018 at 8:15 am | Log in to reply. “I’m so blessed to know this site and really help me with my cooking” I’m also blessed to know a passionate cook like you through my website. You make food for your family, and they are happy, that’s all I need to hear to make me happy, too. Continued good luck with Korean cooking! Posted April 10th, 2018 at 12:15 pm | Log in to reply. Posted April 14th, 2018 at 10:31 am | Log in to reply. You made wonderful, crunchy crunchy chicken, so I’m sure your kimchi making will go well too! Posted March 17th, 2018 at 11:01 pm | Log in to reply. 안녕하세요!! I love your blog and YouTube channel. It is super easy to follow and very inspiring. This is the first dish I tried out but I made a few changes to cater to my family’s taste (my sister is diabetic so I had to cut down the sugar drastically. I also make dak-mu to go with the dakgangjeong. It came out amazing. I’m making mung bean sprouts following your method to add to my miso ramen. Posted March 22nd, 2018 at 8:20 am | Log in to reply. Wow it looks good but I’m wondering how it tastes without sweet sugar? How did you make this so shiny? Posted March 4th, 2018 at 7:19 pm | Log in to reply. Made this recipe yesterday with my mom for dinner and it was delicious! 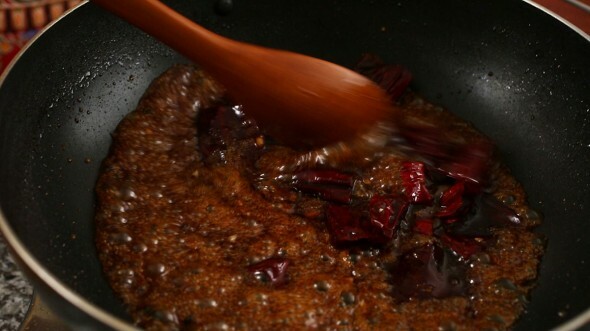 We couldn’t find dried chili peppers so we used fresh ones and they worked perfectly, we also used honey instead of the rice syrup. My family loved it and I will definitely make this recipe again, thanks a lot! Posted March 6th, 2018 at 2:34 pm | Log in to reply. It looks very delicious! I’m so happy to hear that your family loved it! Posted March 7th, 2018 at 1:43 pm | Log in to reply. Posted January 22nd, 2018 at 12:27 pm | Log in to reply. I made this one last weekend: was super deliciousss! In my Korean grocery store in Quito, they only sell the dried peppers in a huge bag, which would last me for 10 years, so I just added a little Gochu-Garu to the sauce instead. But when it was done, I felt something was missing. So instead of using the ginger for seasoning the chicken wings, I put it in the sauce: perfect ! Posted January 22nd, 2018 at 9:23 pm | Log in to reply. BTW: I never fancied either chicken wings, or eating chicken with my fingers very much, but since I tried Dakgangjeong (also made Yangnyeom-Tongdak with chicken wings), I completely changed my mind! Posted January 22nd, 2018 at 5:45 am | Log in to reply. Posted March 6th, 2018 at 2:30 pm | Log in to reply. You made perfect looking dakgangjeong! Crunchy crunchy! Posted January 20th, 2018 at 11:00 am | Log in to reply. Can I use a Chicken leg/thigh or Breast instead of wings for this? I reckon double fried chicken will be amazing! Posted January 28th, 2018 at 10:29 am | Log in to reply. You’d need to adjust the fry times, it would take significantly longer for other parts of the chicken to be cooked through. Posted January 15th, 2018 at 4:50 am | Log in to reply. I made this today. It was my first attempt at fried chicken of any sort so I was nervous. I’m not a big fan of chicken wings though so I substituted breast instead and it still turned out great! (I was so relived) your recipes are easy to follow and so tasty! Thank you!! Posted August 25th, 2017 at 3:38 pm | Log in to reply. I would like to know if i could use maple syrup instead of rice or cornsyrup? Posted August 25th, 2017 at 6:43 pm | Log in to reply. Yes, you can use maple syrup if you like that flavor. Posted August 17th, 2017 at 5:07 am | Log in to reply. This looks very good and I’ll try to make it alongside some other dishes from this site. Since I will be making various dishes I will start out with these chicken wings first. What is the best way to keep the wings when I make them 4-5 hours before eating? How should I reheat the wings? Posted August 23rd, 2017 at 10:55 am | Log in to reply. You don’t have to reheat these. They will also keep crunchy for several hours at room temperature, so you can make them in the morning and then serve later. 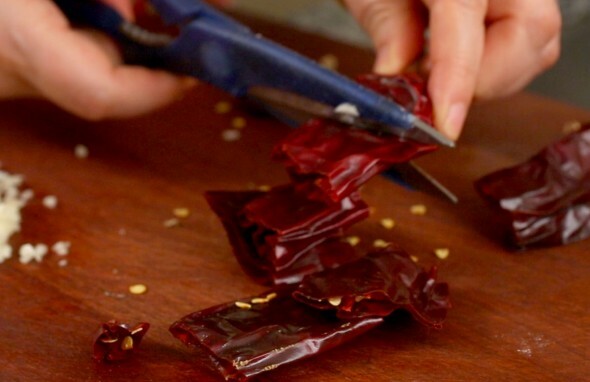 You can even keep the leftovers in the fridge overnight and they will still be crunchy! Posted August 23rd, 2017 at 11:16 am | Log in to reply. Thank you for the reply, last week I made these chicken wings together with Yukgaejang, Yeon-geun-jorim and Oi-muchim. It was my first time cooking Korean but it turned out good. 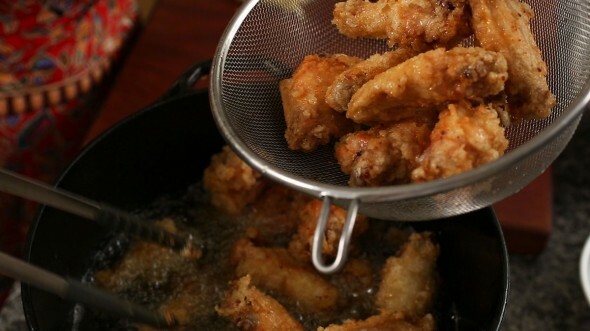 When I finished with the chicken wings my guests arrived so they were served hot and very crunchy. We were with 5 people and even though I made 4 dishes and also served kimchi and rice the chicken wings were all finished in no time. Thank you for the great recipes, the videos really helped to see how it’s done. Posted August 23rd, 2017 at 11:36 am | Log in to reply. Posted July 4th, 2017 at 4:15 am | Log in to reply. 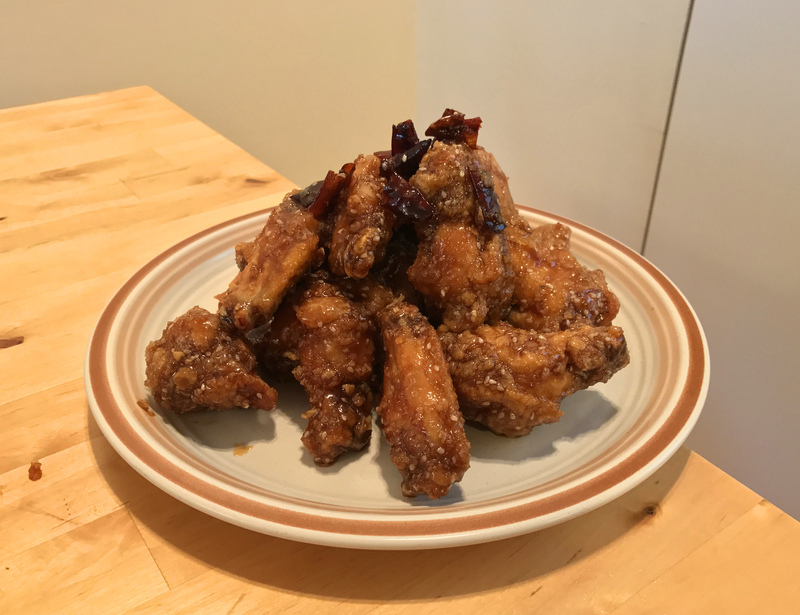 dear Maangchi…i am a very big fan of you..i love cooking though i am working in a company i do not get much time yet i tried cooking dakgangjeong and it really taste awesome..thanks for the recipe..
Posted August 23rd, 2017 at 10:56 am | Log in to reply. I’m happy to hear you enjoyed my recipe! Is the green bits green chili pepper? Posted July 1st, 2017 at 5:00 am | Log in to reply. I’ve installed an application for my Ipad called “Korean recipes” with so many recipes and I made this one first for my sister’s birthday and everyone loved it, they said that it was better than in a very famous restaurant here and my mom even said that she wanted me to try more korean recipes and she didn’t like it before.. I made it exactly how it shows on your video and it came out delicious, the chicken was just like you said crunchy outside, tender and juicy inside I loved it, now I’m going to try egg bread wish me luck! Posted July 1st, 2017 at 11:27 am | Log in to reply. Yes, I wish you good luck with making delicious gyeranppang! Posted June 25th, 2017 at 9:04 pm | Log in to reply. Hello Maangchi, thanks for this recipe. The first time I made this, I used smaller wings (from a pack of cheap “party wings”). With ~20 – ~30m fying time total, the chicken ended up very dry. I think it’s very important that the wings you use look nice and fat, and preferably come whole, not in halves. With ~10m first fry, and ~3m second fry, the chicken came out juicy and tender. We made sure we used ssalyeot and not mulyeot, and it ended up tasting a little *too* much like rice. Maybe this had to do with the brand of ssalyeot we used. With ~10m first fry, and ~3m second fry, the chicken came out juicy and tender. It might be helpful if the recipe had oil temperature, I was kind of winging it (ha ha!). Posted July 1st, 2017 at 11:04 am | Log in to reply. Thanks for the great tips! Many people will find them useful. And your chicken looks perfect! Posted June 25th, 2017 at 7:22 am | Log in to reply. Maangchi, i made this a while ago. The glaze was very tasty and it went well with the chicken. Any tips to make the chicken very moist and crunchy? The video was watched 10,312,461 times on YouTube & has 155,663 likes!